The Sea Eagle 380x, along with it’s longer cousin the 420x, are considered expedition level inflatable kayaks. As such, I consider these kayaks the “workhorses” of the inflatable kayak world. They are suitable for multi-week floats, running pounding whitewater, fishing and lazy floats. On this page, I’ll provide a thorough guide to the Sea Eagle 380x inflatable kayak. It is my hope that the information presented here will provide people with a better understanding of whether or not a high-end yet affordably priced kayak like the Sea Eagle 380x inflatable kayak is the right boat for their uses (hint…it likely is for most uses). The Sea Eagle 380x kayak is a high-pressure inflatable kayak, which allows it to thread its way through large waves without bending. Newly redesigned self-bailing drain valves prevents the kayak from filling up with water in the event you hit a big wave wrong. For solo paddlers, the size of the 380x is just perfect, although the smaller 300x might be preferred by solo paddlers who frequent Class IV rapids. Provided the boat isn’t heavily weighed down, solo paddlers will have few problems maneuvering the boat through waves and around rocks. Do note, however, that for whitewater use – the lighter the boat is, the better. Thus, if you plan on taking the kayak through big waves or heavy whitewater, do not overload the boat with heavy bags or other gear (a lesson learned the hard way!). The Sea Eagle 380 Inflatable Kayak is built out of 1000 denier hull material, which is essentially the same material used in guide-quality rafts that are used for commercial float trips. This tough material allows this inflatable kayak to withstand nasty encounters with rocks, downed trees and gravel bars without puncturing or tearing. I’ve probably put well over 1000 miles on this kayak in the 10+ years I’ve owned it. I’ve put exactly zero holes in it. Granted, I don’t do anything stupid with the boat, such as dragging it over areas that are full of sharp, pointy rocks or where shiny broken glass gleams in the midday sun. And admittedly, I haven’t tried taking my Buck Knife to the boat to see what might happen to the boat, either. Still, 1000+ mies in 15+ years…and zero rips or holes in the boat. To me, that pretty much says it all about the durability of the boat. And if you really feel like it, you can even drive a jeep over it. 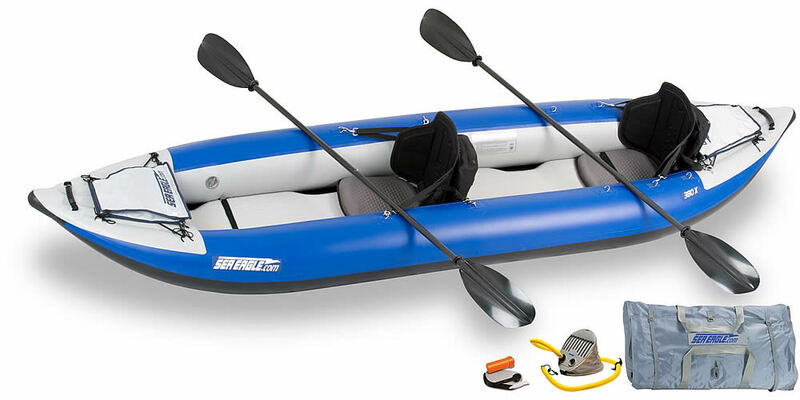 The Sea Eagle 380 Inflatable Kayak has an excellent capacity rating of 750 pounds. This capacity rating makes it perfect for two paddlers plus gear who are on extended float trips. And for solo paddlers, the large capacity of this kayak allows you to literally take everything but the kitchen sink on multi-week trips AND still have room to stretch out in the kayak. Just remember, if you’ll be going through whitewater or big waves – do not overload the boat. Now, let us talk more about capacity. All inflatable boats (kayaks and rafts) have a “capacity” rating. That rating basically means how much weight the boat can float without becoming dangerously overloaded and can still handle tolerably well. Notice the emphasis on tolerably. Any boat that is loaded with people and gear to the boats capacity rating will handle sluggishly, at best. For flatwater (lakes and slow moving rivers that lack whitewater), this isn’t a problem. While the kayak will be a bit more difficult to initially start and to stop, on lakes and flatwater this is a minor nuisance easily overcome with adjustments in paddling technique. However, on rivers with swift flows and whitewater, a sluggish boat is a recipe for an “unpleasant float” at best and a dangerous one at worst. On swift moving rivers, it is crucial that the boat (raft or kayak) respond instantly to paddle strokes and not act like a pregnant whale. Because of this, a rough rule of thumb is that if you plan to float swift moving rivers that contain whitewater, never load the raft or kayak beyond 1/2 the rated capacity. The updated Sea Eagle 380x weighs 38 pounds and packs down into its own moderate sized carry bag. The bag fits into any trunk quite simply and a shoulder strap makes it easy to carry. Once inflated, the light weight of the kayak makes it easy to carry around low-water areas, mandatory portages, or even through the woods to reach seldom floated rivers or lakes. The Sea Eagle 380 sets up very easily. If you are using the bellows pump (the manual pump), give yourself about 15- 20 minutes to infate the boat and get everything else set up. Using an electric pump will shave about 5 minutes off inflation time, on average. The Sea Eagle 380 has many options that can be added onto it, expanding its usefulness. One mandatory option should be the purchase of stow bags, for both the stern and bow. These bags are specifically shaped to fit on top of the kayaks bow and stern. These bags are very useful for storing the bellows pump, the bellows hose and any other “kayak things” you might happen to bring with you while on a float (such as a tie line, among other things). The bags also make a handy place to stash lunch and beverages, too. Another expansion that people should consider for the boat is buying a few more D rings and the glue to attach them to the boat. These D rings allow you to easily attach your gear to the boat in convenient places. While the 380x comes with 6 pre-installed D rings, I’ve found that you can never have enough of these handy rings on the boat. I installed six additional rings on my boat and use them constantly. All Sea Eagle products have a 3 year warranty against manufacturing defects and also come with a 30 day “on-the-water” try-out period. If you don’t like the boat during this try-out period, just send it back – no questions asked. There’s no shortage of inflatable kayaks on the market today. Because of this, it is often difficult to decide which kayak to get – or if a different type of inflatable boat might be better for a persons particular uses. So, let’s go over some of the ideal uses for this kayak. If you want to run Class III or Class IV whitewater, then this boat is for you. Period. While other good quality inflatable kayaks (such as from Aire and NRS) run big whitewater too, they are usually much more expensive and lack the weight capacity and versatility the 380x has. Lastly, if you plan on hitting Class III or greater whitewater, don’t even think of buying a cheap kayak – you’ll immediately regret it the first time you hit the big waves. Inflatable kayaks are far, far easier to paddle across flatwater than traditional rafts are. While the newer “catarafts” and pontoon boats work great for flatwater paddling (due to a rowing frame), catarafts and pontoon boats generally lack the whitewater ability and capacity that the Sea Eagle 380x possesses. Still, if you plan to paddle on flatwater or in Class I/II whitewater and won’t need much weight capacity, a cataraft or pontoon boat is an option to further investigate. The 380x, when you use the detachable skeg, works well for flat water paddling. That said, there are better boats available for those who plan to do lots of flat water/lake paddling (such as in the Boundary Waters or long floats down rivers that have little current). Probably the best inflatable kayak for lake and flat water paddling is the Sea Eagle FastTrack. Another option for lake paddlers is the PaddleSki, also from Sea Eagle. The PaddleSki is a catamaran kayak, which is basically an interesting cross between the 380x Explorer Kayak and a pontoon boat. It works superbly for flatwater paddling, while still retaining the ability to run up to Class III whitewater and the superb durability of the Explorer Kayaks. Several interesting options can also be added on to the PaddleSki, including a sail, rowing frame and a motor. More information about the PaddleSki. The Sea Eagle 380x is ideal for multi-night float trips down remote rivers and in remote lake regions (such as the Boundary Waters). The large capacity allows paddlers to take a good weeks worth of gear with them (just remember to pack light). Since the Sea Eagle 380x is immune to weather, it can be used in well-below freezing conditions or on the hottest of days without any worries about damage to the fabric. And the superb durability of the kayak should remove fears of “getting stranded” due to a leaks, tears or punctures in the kayak. For multi-night float trips, no boat is better than the Explorer Series of inflatable kayaks from Sea Eagle. The Sea Eagle 380 Explorer Inflatable Kayak is, in my own opinion the best inflatable kayak on the market for the price you pay – and is happily priced much less than other quality inflatable kayaks you’ll find by a significant margin. In terms of “bang for the dollar,” the Sea Eagle 380x (and its larger cousin, the 420x) are hard to beat. The Sea Eagle 380x Inflatable Kayaks versatility, durability and portability make it ideal for anyone who can only afford one boat and want to be able to fish in it, run whitewater rapids, aimlessly float rivers or paddle around on lakes – while still being able to pack the boat into the trunk of your car. In short, this inflatable kayak is the perfect all-around inflatable boat.